The free KIDO'Z browser is really more of kid-safe gateway to Web-based fun and games. Yesterday we looked at Quintura, a search engine designed with kids in mind. Today let's turn our attention to the browser itself, which is not only a potentially confusing environment for kids, but also an unintentional (for them, anyway) gateway to the Web's seamy underbelly. For most kids under the age of 10, the main attractions of a computer are games, videos, and Web sites. (PBSKids.org is particularly popular destination around these parts.) 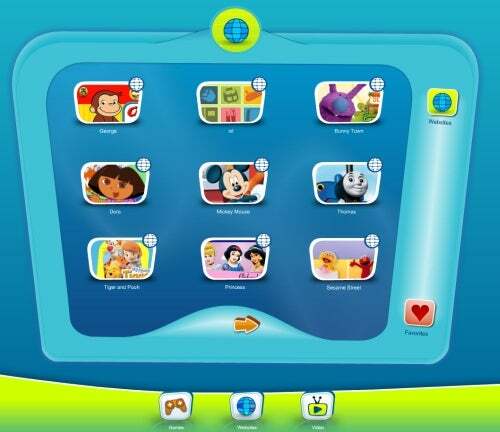 KIDO'Z is a specialized browser that serves up exactly those items, all within a safe, colorful, kid-friendly interface. KIDO'Z requires Adobe Air. With that in place, it takes just a few clicks to install Kido'Z and set up a free account, which requires little more than a username and password. The interface resembles a TV, with colorful icons for switching between the Games, Websites, and Video "channels." Within each channel: pages and pages of preselected content, with each item represented by a colorful, recognizable thumbnail (Dora, Curious George, etc.). There's also a Favorites button so your kids can easily return to their preferred games, videos, etc., without having to search through all the pages again. KIDO'Z has a password-protected Parental Controls page where you can manage content, adding new videos and Web sites or blocking material you may find inappropriate. In short, KIDO'Z is a slick, well-designed app that's perfect for parents who want to let young kids have a little fun online, but who don't want to worry about inappropriate content. Though it's designed for ages 3-7, I think 8- and 9-year-olds would enjoy KIDO'Z as well.